Just as our love for God begins with listening to God’s Word, the beginning of love for other Christians is learning to listen to them. God’s love for us is shown by the fact that God not only gives us God’s Word, but also lends us God’s ear. We do God’s work for our brothers and sisters when we learn to listen to them. So often Christians, especially preachers, think that their only service is always to have to “offer” something when they are together with other people. They forget that listening can be a greater service than speaking. Many people seek a sympathetic ear and do not find it among Christians, because these Christians are talking even when they should be listening. But Christians who can no longer listen to one another will soon no longer be listening to God either; they will always be talking even in the presence of God. The death of the spiritual life starts here, and in the end there is nothing left but empty spiritual chatter and clerical condescension which chokes on pious words. Those who cannot listen long and patiently will always be talking past others, and finally no longer will even notice it. Those who think their time is too precious to spend listening will never really have time for God and others, but only for themselves and for their own words and plans. For Christians, pastoral care differs essentially from preaching in that here the task of listening is joined to the task of speaking the Word. There is also a kind of listening with half an ear that presumes already to know what the other person has to say. This impatient, inattentive listening really despises the other Christian and finally is only waiting to get a chance to speak and thus to get rid of the other. This sort of listening is no fulfillment of our task. And it is certain that here, too, in our attitude toward other Christians we simply see reflected our own relationship to God. In the latter paragraph, Bonhoeffer describes a false, inadequate kind of listening. In reading what is lacking there, we can see the qualities required of a good listener. Are you someone who listens in that way? 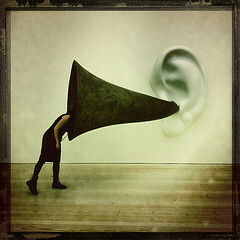 Do you listen with a “whole” ear? Do you presume that you will hear something unique and valuable? Do you love the speaker? Do you waive your right to speak? Do you hope to keep the other person in your presence, sharing with you? Are you fulfilling your task, to your neighbors and to God? § 4 Responses to Are You Listening? Really Listening? I needed this today. I find I desperately want/need somebody who would really, really listen and yet I find it difficult to be that person for somebody else. Something to work and improve on and to ponder in my heart. Thank you. Thought I’d already replied to this. Sorry. I hope that you find a good listener and that you find someone who needs a good listener. Maybe they’ll end up being the same person. Great reminder! Good to keep the perspective of listening – so often we seem to think that telling is our only job. This is a great perspective! Thanks. Since I wrote this I’ve found some books on the “art” of listening. Looking forward to learning more. You are currently reading Are You Listening? Really Listening? at Clearing Customs.